John Nash was born in London, 1893, and educated at Wellington College. Famously, for such an esteemed artist, he never attended art school; in fact his older brother, Paul Nash, who attended the Slade School of Art, dissuaded John from a more formal training whilst encouraging him, nevertheless, to pursue his early artistic interests in drawing and watercolour. 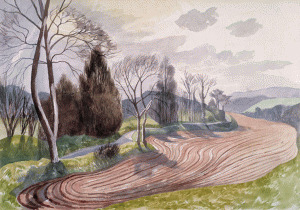 When John was young the Nash family moved from urban London into the Buckinghamshire countryside near Iver Heath – a gentle terrain of rolling hills, fields with hedgerows and trees which would inform his visual vocabulary, and also provide stimuli for much of the content with which he would become concerned. Here John befriended the artist Claughton Pellew who was to encourage his interests in watercolour, and in the painting of the natural world. Pellew invited John to look – to attend to that which surrounded him; but he also taught by example, for Pellew had a deep, not to say rhapsodic love for the countryside which in many ways John learnt to share. John first exhibited (1913) at the Dorien Leigh Gallery, London, then with the Camden Town Group (1913-14) and soon after (1915) with The London Group at the Goupil Gallery. These exhibitions met with considerable success and resulted, towards the end of the 1914-18 war, in an invitation from the War Propaganda Bureau to become an Official War Artist. In this capacity John painted his iconic works Oppy Wood and Over the Top – two of the most important and memorable images to have come from the 1914-18 conflict. Nash started to teach first at the Ruskin School of Art, Oxford (1924-29), and then, appointed by William Rothenstien, at the Royal College of Art as Assistant Teacher of Design (1934-1957). Here he met and befriended Eric Ravilious and Edward Bawden, and with each he enjoyed painting excursions – with Ravilious to the Bristol Docks, and after moving to Wormingford near Great Bardfield, with Bawden to the Essex countryside. The similarities between John Nash’s watercolour work and that of both Ravilious’ and Bawden’s is clear – with Ravilious’s work especially where a gift for understatement, a subtlety of colour and a tonal range well suited to the countryside is particularly evident. Both Nash and Ravilious worked best with watercolours. Lighter than oils, watercolour allows for a subtlety of tone harder to achieve in the denser medium; and water-saturated pigments have, perhaps, a natural sympathy with both artist’s chosen focus on an English landscape which is itself so often sodden with moisture. There is similarity, too, in both Nash’s and Ravilious’ discernment of underlying structure – the design behind the picture. Nash declared:…’in looking at landscape its abstract features appeal pretty quickly. Although representational, I am primarily interested in the structure underneath…’*; and in his best works it is this strength of underlying structure, or clearly perceived pattern, which is most evident. Besides acclaim resulting from exhibitions of Nash’s watercolour works at the French Gallery London (1933); the Graves Art Gallery, Sheffield (1953); and a major retrospective at The Royal Academy of Arts (1967), Nash was to find critical appreciation through his wood engravings. Nash was an early member of The Society of Wood Engravers and he produced a body of wood engraved illustrations with a particular emphasis on the portrayal of botanical subjects. Amongst these works, and containing some exceptional images, are his engravings for Poisonous Plants: Deadly, Dangerous and Suspect (1927) – a book for which he and his publishers, the Haslewood Press, would receive high acclaim. Nash was elected Royal Academician in 1951, and received the C.B.E in 1964. He died in September 1977. His work can be found in major art collections around the world.